Purpose: The purpose of this study was to explore the use of loupes and lights in dental hygiene programs, to assess why they are being used, and to evaluate at what point in time they are introduced to students within the curriculum. Methods: A 20 question survey was developed and pilot tested. The survey was disseminated electronically to 335 dental hygiene program directors in the United States. Frequency distributions were analyzed to provide an overview of the data and Fisher's Exact Test was used to investigate differences between technical/community college programs and university-based programs. Results: Out of the 335 electronic surveys, 143 were completed for a response rate of 47%. Prevention of musculoskeletal disorders, ergonomics, and enhanced vision for instrumentation remain the top three advantages of using loupes. Ninety-six percent of respondents indicated students use loupes and over 50% of faculty use loupes. Fifty-seven percent of dental hygiene programs encourage students to purchase loupes with a light. 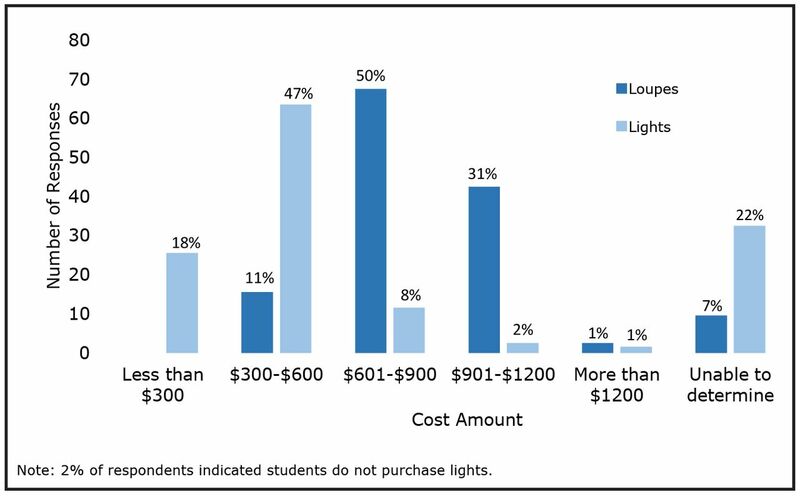 Fifty percent of students pay $601-$900 for loupes and 47% pay $300-$600 for a light. Conclusion: Student and faculty use of loupes and lights are increasing in educational programs. Future research should focus on the longitudinal impact of using loupes/lights, the prevention of musculoskeletal disorders, and an investigation of the continued use of loupes in a professional setting post-graduation. Research indicates that introducing loupes to dental hygiene students may reduce the development of poor ergonomic habits.9,12 However, the use of loupes has not been systematically incorporated in dental hygiene curricula as a best practice,9 and there are no accreditation standards requiring loupes.9 There are, however, growing numbers of practicing dental hygienists using loupes and lights to enhance visibility and improve ergonomics, often as a result of having used them in their educational programs.9,13 The inclusion of the use of these optical aids in a dental hygiene program can potentially lower the risk of cumulative trauma (MSDs) and reduce eyestrain, which may in turn prolong dental hygiene careers.9 The purpose of this study was to explore the use of loupes and lights in dental hygiene programs, to assess why they are being incorporated, and to evaluate at what point in time they are introduced to students within the curriculum. University of Michigan (U-M) Health Sciences & Behavioral Sciences Institutional Review Board (IRB) determined this study was exempt from IRB oversight. (HUM00102763) E-mail addresses of the 335 dental hygiene program directors was obtained from the American Dental Hygienists' Association (ADHA) Entry-Level Dental Hygiene Program Directory for this cross-sectional study. The survey questions were adapted with permission from Congdon et al. and modifications were completed in consultation with the U-M Center for Research on Learning and Teaching (CRLT).9 Content validity was determined through pilot testing with four U-M faculty members. Modifications to the survey were made based on feedback. The electronic survey consisted of 20 questions including multiple choice, open-ended, Likert-scale, and yes/no options. The first four questions focused on the institutional category, degree conferred, the percentage of faculty using loupes, and a yes/no response question to students' use of loupes. Respondents who answered, “yes, their students used loupes,” were then asked if the students were required, encouraged, or neither. They were also questioned on the use of lights, at what point in time loupes were introduced in the curriculum, advantages of using loupes and lights, and the overall cost of the equipment. Respondents who answered “no, their students were not using loupes,” were then asked if the inclusion of loupes and lights would be considered at some time in the future. In addition, questions were asked regarding the number of hours dedicated to this topic in the curriculum, reasons why loupes are not being utilized in their program, and at what point in the curriculum did they feel that loupes should be introduced. The survey was disseminated using Qualtrics software. Dental hygiene program directors received an email introduction/invitation describing the purpose of the project, informed consent, and a link to the survey. The survey was open to participants for one month with three reminder notifications emailed. Data analyses were performed using the IBM Statistical Package for the Social Sciences (SPSS) version 24. Frequency distributions were analyzed to provide an overview of the data. Fisher's Exact Test was used to investigate differences between technical/community college programs and university-based programs. Significance was set at p<0.05. Out of the 335 electronic surveys, 143 were completed for a response rate of 47%. Table I provides a summary of respondents including the type of educational setting and the degrees conferred. Of the total respondents, 70% were from dental hygiene programs conferring an associate's degree, with 55% from community college programs and 13% from a technical/vocational school. Twenty-two percent of respondents were from universities not associated with a dental school and 10% were from programs associated with a dental school. Ninety-six percent of the respondents indicated students used loupes in their educational programs while only 4% indicated that the students were not using loupes. Figure 1 illustrates whether or not programs require or encourage the use of loupes and lights. Of the 96% of the respondents indicating that their students used loupes, 44% required their use. In dental hygiene programs not requiring loupes, 42% of the respondents encouraged the use of loupes within the curriculum, while 14% stated they neither require nor encourage students to use loupes. With respect to the use of lights, 57% of the respondents stated that students are encouraged to use lights, 9% require lights, and 34% neither require nor encourage their students to use lights. When respondents were asked to report on the percentage of faculty use of loupes, 52% reported that between 76-100% used loupes. (Figure 2) This was followed by 17% reporting between 1-25% using loupes in clinic and 17% indicating between 51-75%. Twelve percent indicated between 26-50% and 2% stated that none of their faculty use loupes in clinic. When asked the number of hours in the program dedicated to education about the use of magnification and ergonomics, 76% reported spending 1-3 hours, while 4% spent more than 6 hours, and 1% do not include magnification at all in the curriculum. (Table II) A reported 39% of the respondents estimated that students begin using loupes during the first semester pre-clinic course, 36% begin using loupes when they start treating patients, and 4% do not use loupes in the dental hygiene program. No statistical significance was found when the Fisher's Exact Test was applied to explore the differences between technical/community college programs and university-based programs for each of the survey questions. Respondents were asked to identify the two most important advantages to using loupes. (Figure 3) Improvement in ergonomics and posture was reported by 77% of the respondents as being the most advantageous, followed by enhanced vision for instrumentation (57%), decreased musculoskeletal pain (19%), improved reading of the periodontal probe (18%), obtaining good habits for clinical care (12%), calculus detection (4%), soft tissue assessment (1%). One percent of the respondents reported no advantages to using loupes. Student expenses for loupes and lights are shown in Figure 4. Fifty percent of the respondents reported paying between $600 and $900 for loupes, while 31% paid between $900 and $1200. In addition, 11% indicated students spending between $300-$600. With respect to lights, 47% spent $300-$600 and 22% were unable to determine the costs. This study examined the inclusion of magnification loupes and lights in dental hygiene programs. Nearly all dental hygiene programs participating in this study indicated loupes were being utilized by their students. In 2012, Congdon et al. 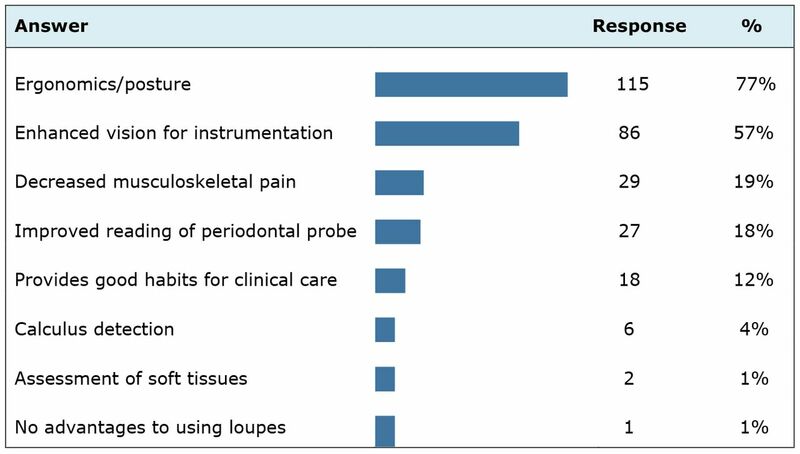 reported 23.8% of dental hygiene programs required the use of loupes while this study found 44% of programs required loupes.9 The increase is notable and may be related to a better understanding about the improvement of clinical posture and clinical performance while using loupes.12,14,15 Additionally, more companies are now manufacturing loupes, making pricing more competitive. As noted in Congdon et al., this study also found a majority of respondents believe loupes should be introduced in the first year of a dental hygiene program, with one-third indicating pre-clinic.9 The adjustment period is a noted disadvantage to wearing loupes.17 If introduced early in the curriculum, students have the ability to learn instrumentation while wearing loupes, lessening the effects of having to readapt to instrumentation, and reduce potential symptoms such as headaches and vertigo when using loupes in the future.17 Introducing loupes in pre-clinic could also enable students to more efficiently learn psychomotor skills as well as enrich proficiency and self-confidence during instrumentation.11 Others indicated the second year of the program would be the appropriate time to incorporate loupes into the curriculum. Perhaps those respondents felt students are overwhelmed with the new concepts of instrumentation in pre-clinic, and think it is best they feel comfortable in clinic before introducing loupes. 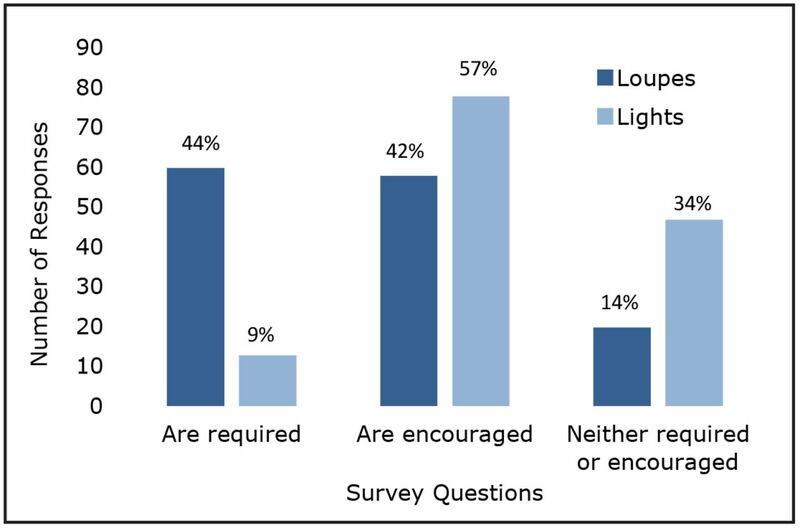 Interestingly, over half of the study respondents encouraged the use lights in conjunction with loupes for their students. Adequate lighting allows a clinician to more easily assess patient issues and provide quality care. The use of lights improve ergonomics by encouraging a neutral position, enhance visibility, and reduce eye strain.20,21 In addition, the inclusion of a headlamp can improve the ability to detect caries.19 These reasons may support why faculty encourage the use of lights. Students need to be attentive to the type of light they are purchasing. Guidelines have been established to minimize the potential hazards from the use of LED headlights.22 In addition to following safety guidelines, faculty need to educate their students about the potential risks to the eyes when using LED illumination. Another factor students consider when purchasing loupes and lights, is their cost. Adding the purchase of this additional equipment to the rising costs of tuition, books, instruments, and housing, could be perceived as an additional financial burden for students. Perhaps institutions could utilize discounts offered to students and could also consider ways to bundled this purchase into a financial aid package. Expanding education about the benefits of loupes and lights could potentially assist students in understanding the value of such a costly purchase. Despite the notable 47% response rate of program directors to this survey, there are limitations to this study. The results may not be an accurate representation of all dental hygiene programs since respondents were solely the program directors reporting on student and faculty loupe and light use. Further studies elucidating responses from students as well as faculty could give clearer depiction of why and when loupes are utilized within the dental hygiene curriculum. Utilization of loupes and lights are increasing for both students and faculty in dental hygiene programs. The use of loupes may prevent occupational hazards of MSD injuries, enhance ergonomics, improve vision for instrumentation, and decrease visual deficiencies. Cost remains the greatest barrier to incorporation of loupes and lights and cost-effective means for their inclusion in dental hygiene educational programs should be considered. Future research should focus on the impact and safety of lights. Longitudinal studies on loupes and lights and their role in preventing MSDs should also be pursued as well as investigating how many students continue to use loupes in a professional setting post-graduation. Michelle C. Arnett, RDH, MS, is an adjunct clinical lecturer and a clinical research coordinator in the Department of Periodontics and Oral Medicine; Anne E. Gwozdek, RDH, MA, is a retired clinical assistant professor and director of dental hygiene graduate and degree completion Programs in the Department of Periodontics and Oral Medicine; Sahira Ahmed, RDH, BSDH, is a 2016 graduate of the University of Michigan School of Dentistry Dental Hygiene Program; Hunter D. Beaubien, RDH, BSDH, is a 2016 graduate of the University of Michigan School of Dentistry Dental Hygiene Program; Kristen B. Yaw, RDH, BSDH, is a 2016 graduate of the University of Michigan School of Dentistry Dental Hygiene Program; Iwonka T. Eagle, RDH, BS, MS, is a clinical assistant professor in the Department of Periodontics and Oral Medicine; all at the University of Michigan School of Dentistry, Ann Arbor, MI.
. Changes in posture: a case study of a dental hygienist's use of magnification loupes. Work. 2010;35(4):467-76.
. The effect of wearing loupes on upper extremity musculoskeletal disorders among dental hygienists. Int J Dent Hyg. 2014 Aug;12(3):174-9.
. Musculoskeletal disorders in a 3 year longitudinal cohort of dental hygiene students. J Dent Hyg. 2014 Feb;88(1):36-41.
. Predictors of work-related musculoskeletal disorders among dental hygienists. Int J Dent Hyg. 2012 Nov;10(4):265-9.
. Musculoskeletal disorders among female dental personnel--clinical examination and a 5-year follow-up study of symptoms. Int Arch Occup Environ Health. 1999 Sep;72(6):395-403.
. Musculoskeletal disorders of the neck and shoulder in dental hygienists and dental hygiene students. J Dent Hyg. 2007 Winter;81(1):10.
. Effect of working characteristics and taught ergonomics on the prevalence of musculoskeletal disorders amongst dental students. BMC Musculoskelet Disord. 2013 Apr 2;14:118-25.
. Musculoskeletal disorders of the neck and shoulder in the dental professions. Work. 2010;35(4):419-29.
. Magnification loupes in U.S. entry-level dental hygiene programs occupational health and safety. J Dent Hyg. 2012 Summer;86(3):215-22.
. Dental students' knowledge of ergonomic postural requirements and their application during clinical care. Eur J Dent Educ. 2011 Feb;15(1):31-5.
. The effect of magnification loupes on the performance of preclinical dental students. Quintessence Int. 2011 Jan;42(1):45-55.
. Effect of magnification loupes on dental hygiene student posture. J Dent Educ. 2008 Jan;72(1):33-44.
. A sustainable plan for your body: ergonomic decisions can determine the length of dental career. RDH. 2016 Mar 16;36(3):96-C3.
. Musculoskeletal symptoms among dentists in relation to work posture. Work. 2000;15(3):153-8.
. Effect of magnification lenses on student operator posture. J Dent Educ. 2004 Mar;68(3):384-9.
. The value of loupe magnification: an underused tool in emergency medicine. Am J Emerg Med. 2007 Jul;25(6):704-7.
. Introducing loupes to clinical practice: dental hygienists experiences and opinions. Int J Dent Hyg. 2016 Aug;14(3):226-30.
. Visual acuity of dentists in their respective clinical conditions. Clin Oral Investig. 2014 Dec;18(9):2055-8.
. In vitro evaluation of magnification and LED illumination for detection of occlusal caries in primary and permanent molars using ICDAS criteria. Dent J. 2013 Sep 25;(3):19-30.
. Seating, positioning, and lighting keep your body injury-free with these cornerstones of ergonomics. Dimens Dent Hyg. 2008 Sep;6(9):36-7.
. Shine a light. Dimens Dent Hyg. 2012 Sep;10(9):25-7.
. The possible ocular hazards of LED dental illumination applications. J Tenn Dent Assoc. 2013 Fall-Winter;93(2):25-9.
. Musculoskeletal disorders and working posture among dental and oral health students. Healthcare (Basel). 2016 Jan 23;4(1). pii: E13. doi: 10.3390/healthcare4010013.
. Ergonomics in dentistry: experiences of the practice by dental students. Eur J Dent Educ. 2017 Aug;21(3):175-9.